… well, at least that’s what it feels like! In the past 10 months I’ve learnt a lot of new tricks and techniques about illustrating in 3D. These have given me a few thoughts about my Amelia Dyer illustrations. Looking at them now, just over a year after completing them, they look a bit amateurish and flat. So I now have this little nagging voice in my head saying I should redo them all, and start working on the 2nd edition of my horror story. The Amelia Dyer story is my most successful picture book in terms of sales so I feel obliged to improve on the illustrations in the book. I’m currently working on my third children’s book so this must be prioritised. Once I’ve completed that, rather than start on a new original story, I will go back to my Amelia Dyer’s illustrations. Although it feels like the work is never ending, I’m pretty much looking forward to revising and improving the illustrations. It feels like I can’t escape the ghost of Amelia Dyer. It’s forever drawing me back; it’s the Amelia Dyer curse! When I first started thinking about Willisa, the witch in my picture book, I knew I didn’t want her to look like a typical witch. You know; long black hair, green skin, big pointy nose, black clothes, striped witch-tights, pointy witch hat, a cat companion, etc. The only traditional witch paraphernalia that I wanted in Willisa was a flying broom. But I didn’t have much success in designing a new kind of witch. No matter how much I tried, it just didn’t work. I ended up with a witch that has pretty much the same characteristics as your traditional witch. I kept the long black unruly witch hair. I didn’t make her skin green but I gave her a pointy witch-nose and a pointy witch hat! She may not have a cat companion, but she does wear an outfit that has cat paws all over it. A subtle (?) reference that she does love her cats maybe? In terms of her personality, I imagine Willisa young and very outgoing, full of energy and with a positive outlook in life. Willisa is not an evil witch, she can be mischievous, as most people with a young mind tend to be, but I did write her as naïve. And it is her naivety and her inabilities to foresee the consequences of her actions that lands poor little Pete in huge trouble and drives the plot of my story. If you observe children on a monkey bar or playing on a balance bar, you will note that more often than not they’re fearless, blissfully unaware of any danger. Gymnasts have a fierce attitude and look amazingly confident when performing. I wanted to combine these two qualities in Willisa; the child and the professional. 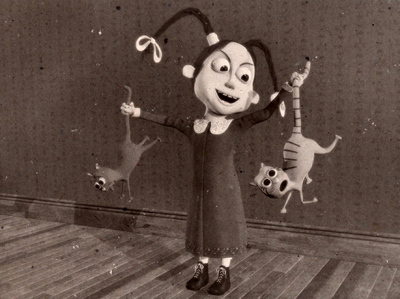 So to convey her youthfulness, confidence and child-like energy, I decided that, whenever Willisa appears in my book she will be riding her flying broom posed in a way only a professional gymnast would be able to pose, but with the facial expression of an excited child. I’m currently in the process of testing out different styles for my latest picture book, entitled Pete and the Enchanted Book. Mostly I’ve been concentrating on the style of the characters, which are a bit more detailed than the ones in my Amelia Dyer story. This is mainly because I’ve learned a bit more about modelling and texturing since I finished work on Amelia, so I’m putting these new skills to work. 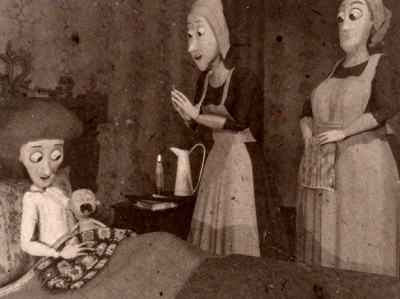 Pete and the Enchanted Book contains several characters. 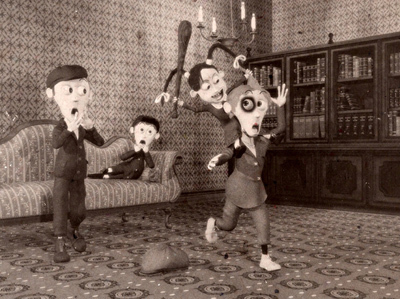 The picture below introduces the TV crew, which has a small but very important role in the story of Pete. When they appear in the story, they will be reporting outdoors, but I wanted to experiment and play a bit with the lamp settings in Blender, so I built a very simple TV studio background, to allow me to play a bit with lighting and colour. In the last couple of years, I’ve learned just how important lighting is and the difference it can make to a 3D render. Lighting a 3D scene is an area I would like to learn more about, so I’m hoping to find a course or book in the next few months that could teach me more about this. 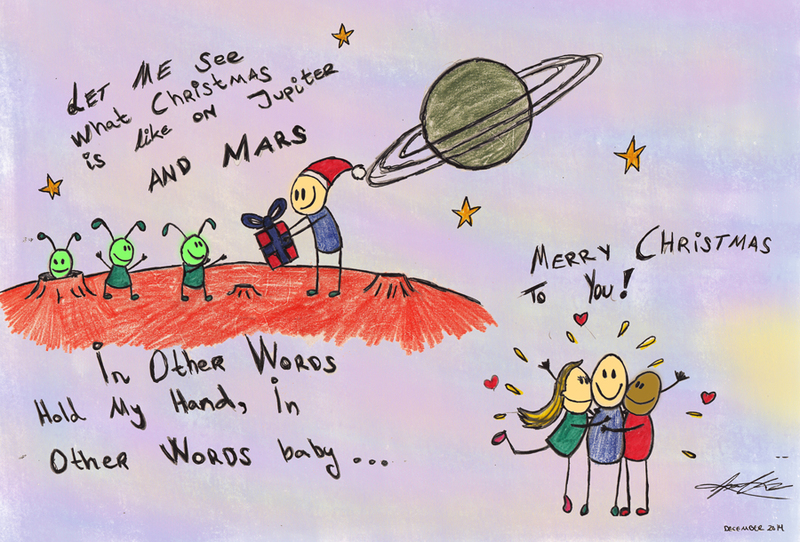 This is probably my last blog entry before Christmas and New Year, so Happy Christmas to you all and thanks for following / reading my posts in 2015. Please note: Amelia Dyer is part of my Horror Vault stories and is NOT suitable for younger readers. If this had been a film I would give it a 12A rating. The story contains no strong language but has occasionally some gory moments. She looked like an angel, sent down from heaven. Grew up to be wicked, deviant, and wild! Hung them upside-down, and stuffed them in her mittens. Her story’s so grim you might think that it’s fiction. Feared their little sister and her sadistic games. For no one was safe when Amelia was near. To hurt other people filled her with cheer. Fully convinced that the girl was satanic. Sure that she’d be the first one slaughtered. 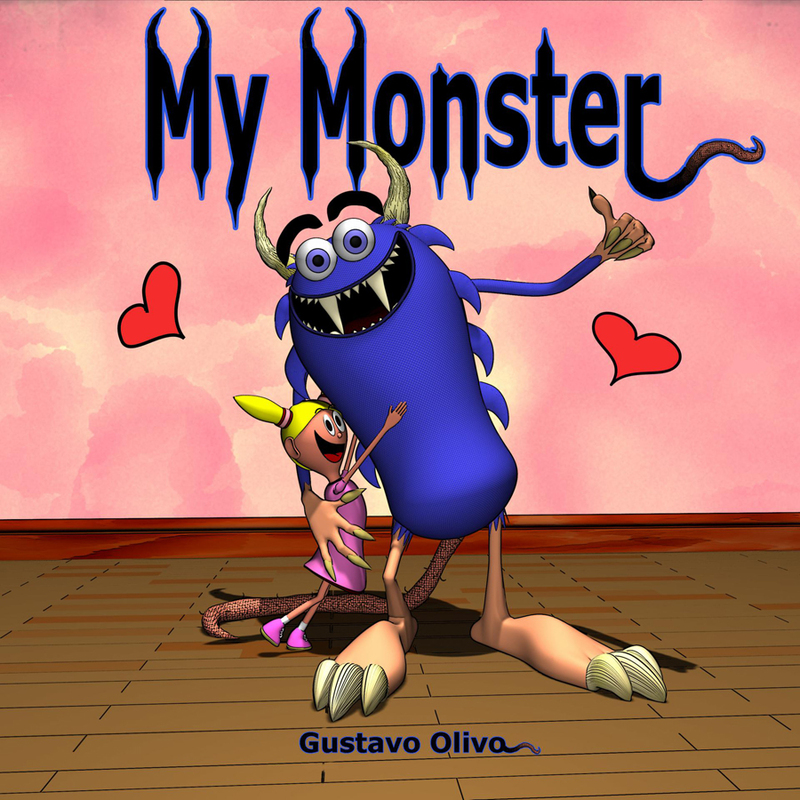 To start 2015 on a positive note, I decided to publish “My Monster” as an e-book on Amazon (here’s the link should you wish to have a look). It’s currently only available as an Amazon download, which means it can be viewed on any Amazon e-book reader. But owning a Kindle device is not essential to reading Kindle books ; there’s a PC version and a Kindle app for iOS devices too. 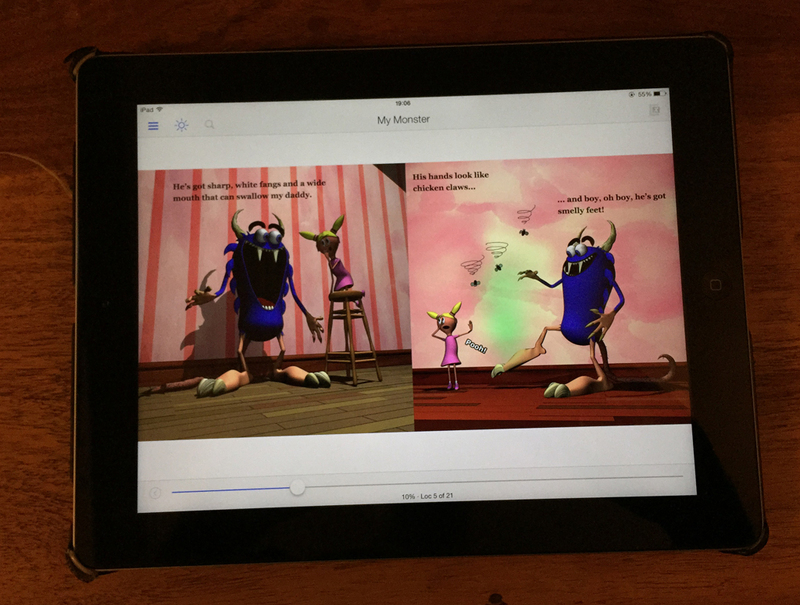 This is what my Kindle book looks like on the iPad! 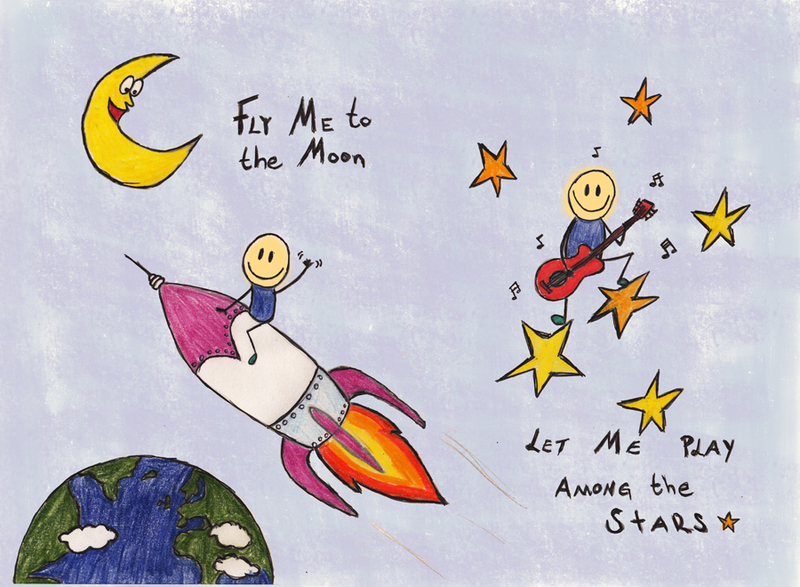 I’m hoping that 2015 will allow me to publish at least one more book (my Amelia Poem); digitally and on paperback. 2015 will be a very busy year, so without further ado, I’ll crack on with my work. Catch you all later! A few months ago, I felt chuffed when I opened my inbox and received two wonderful photos. 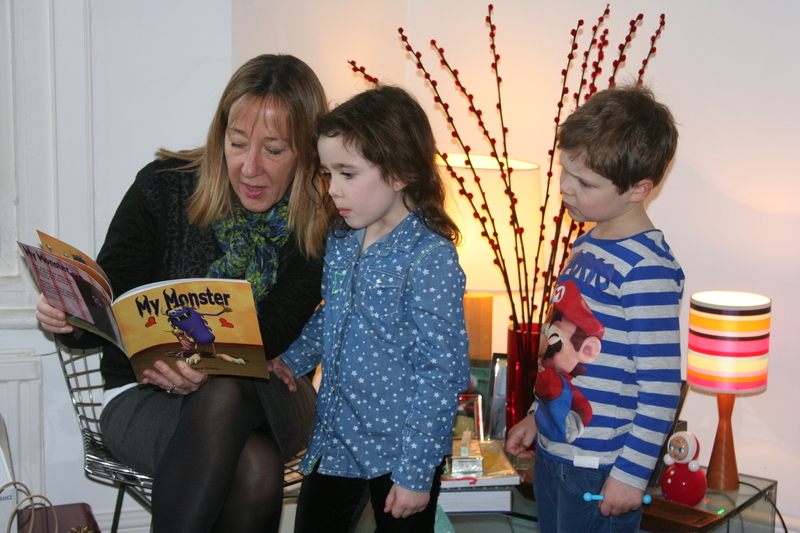 My friend, Harriet, had purchased “My Monster” the picture book as a present for her nephew. 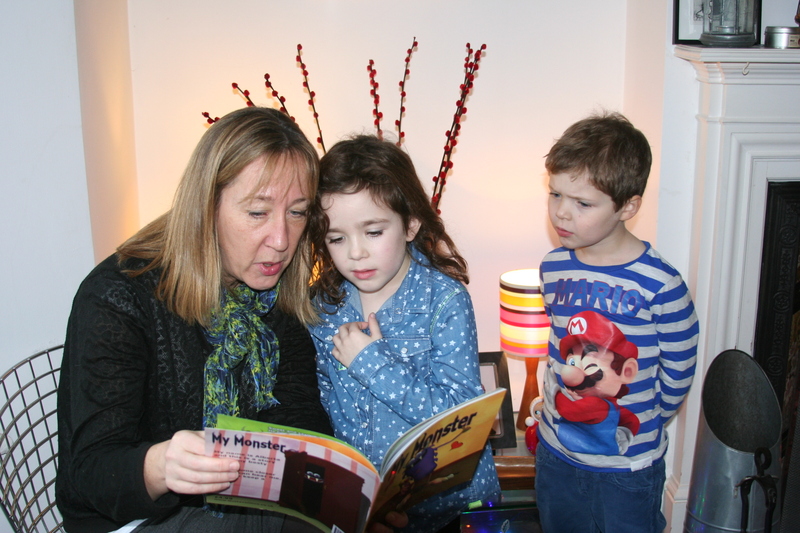 However, her cousin, Carol (the lady in the photo) decided to take a sneaky look inside with her two children; Henrich and Lucy, before wrapping the book. Judging by the look on their faces, they seemed quite intrigued by the story-telling. Thank you Harriet for sending these splendid photos 🙂 It’s always nice to see people enjoying my books! 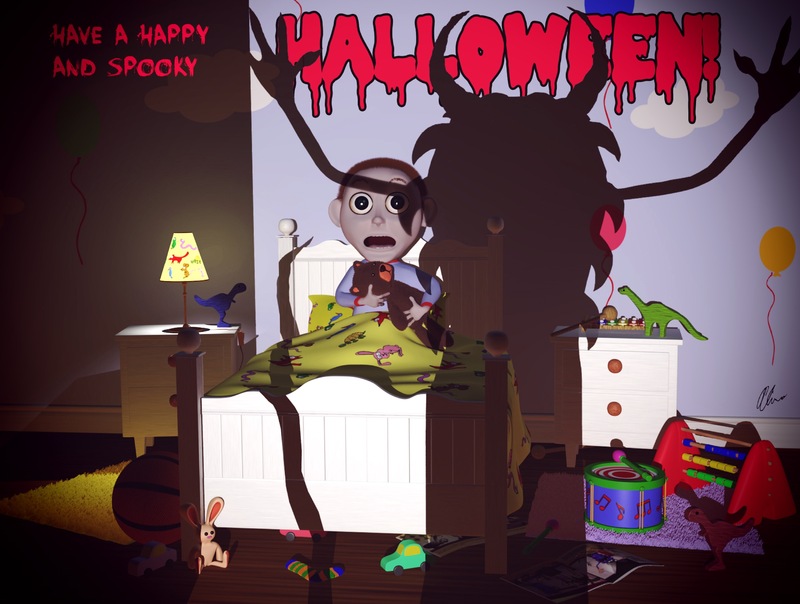 Have a happy and a spooky Halloween! Now make sure you watch a good horror film this week! Have a spookylishous Halloween! 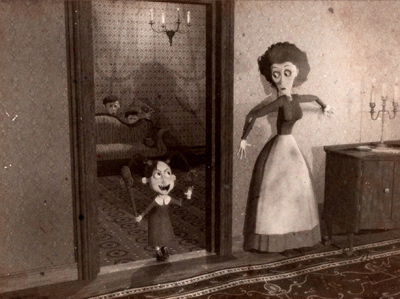 Amelia heard a ghoulish moan at the door where she saw a child’s apparition. Testing out different colour styles for my Amelia story. The filters I’ve applied to the picture above is faux film (adds grain and brightness to create a vintage film look) and a filter called Helga. I probably won’t decide on the style until I have finished illustrating all the pics for my book, but I’m enjoying experimenting and messing about with different photo styles at the moment.